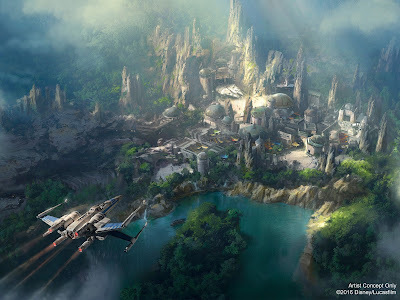 Rumor: Details About What to Expect from the Rides at "Star Wars Land"
Construction is underway on the upcoming Star Wars park expansion coming to Disneyland and Disney World, and it is shaping up to be unlike anything else at the Disney Parks. Mice Chat has revealed some new insider information about the two announced rides, a Millennium Falcon ride and a stormtrooper battle ride. According to their sources, Disney is trying to make story a focus of the two rides, meaning the attractions will involve more than just the ride themselves, with passengers having to disembark and re-board the ride several, to tell a larger story. "WDI wants to leapfrog the competition at Universal Studios by creating an immersive Star Wars environment that is more akin to Renaissance Faire cosplay than a theme park land. Shops and dining would be hyper-themed and operated like elaborate dinner theaters and living history museums. When it comes to the two E Ticket rides, visitors would be guided through long plot-filled stories that take them through multiple environments before they board their ride vehicles. In the case of the Millennium Falcon ride, code-named Big Bird at WDI, the experience would involve moving between multiple pre-show theaters setting up the plot and what tasks you must complete once you board the Falcon and launch into space. And if you fail at your assigned tasks, a happy ending is not a guarantee." In the case of the Stormtrooper Battle Escape ride, code-named Alcatraz, WDI wants you to rush to your wireless and trackless vehicle and board and then disembark and re-board the vehicles on different levels of the massive ride building several times during the course of a long experience, all while under attack by Stormtroopers. The pit currently being dug deep into the ground on the Alcatraz site is required for the elevator mechanism that will make the multi-level ride possible. Imagine riding Pirates of the Caribbean, but getting off your boat in the caverns to explore the skeletal remains, getting back in your boat quickly when you hear Barbosa attacking the fort, sailing along until you get out of your boat a second time in the auction scene to interact with the panicky townsfolk for a while, then re-board your boat quickly when the fire breaks out to escape by sailing through the rides finale’. As an additional point of reference, Disneyland’s Pirates has 75 animatronic figures, but Alcatraz will have over 150 animatronic Stormtroopers alone, plus additional animatronic Star Wars characters from the tiny to the gargantuan. With Star Wars, WDI wants to blow your mind when it comes to what you think a Disneyland ride can do and how you interact with it. And they’ve already begun to use that same criteria in planning DCA’s upcoming new Marvel rides and park expansion. 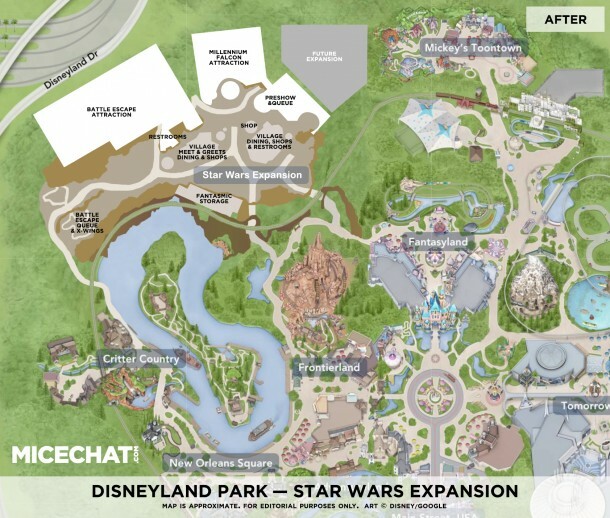 We still don't know when the Star Wars park will open, but based on these it sounds like it will be well worth the wait!